Cookies helps to remember your online passwords. All the passwords saved in your browser, so you need not to type passwords every time. But security is the biggest problem from this. If any one open browser in your computer they may theft all your passwords, history, bookmarks etc.. If you using Firefox there is a Master Password option to protect your saved passwords but unfortunately Chrome not having like that features. So others can find all your secret informations easily. Here is the cool extension that called Simple Startup Password for protect your secret information on Google Chrome. 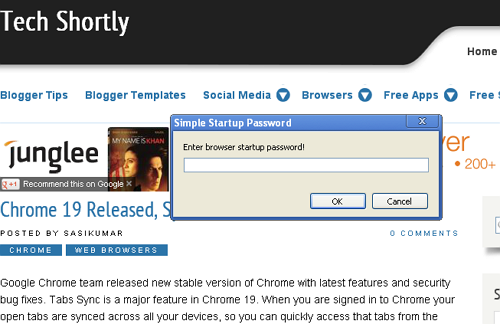 Go to this link and install Simple Startup Password extension into chrome browser. After installed simple startup password extension go to Tools - Extensions - Simple Startup Password - options and type your password and save it. Then close the chrome browser and re-open it. It asks password simply enter the password and continue your browsing. If password enters incorrectly the browser will automatically closed. They can view only browser home page with out having correct password. So all your saved informations will be safe on Google Chrome. Warning - Do not lose or forget your password. You will have to reinstall your browser to use.